Our pregnancy massage treatment is performed on our speciality tailor-made pregnancy body cushion. It's soft memory foam design provides maximum comfort and support as you receive your massage cradled side-lying in the cushion. We use an organic wheat germ oil packed with natural vitamin E for your massage to deeply nourish and hydrate your skin. Our top-to-toe maternity massage creates the perfect opportunity to rest, recharge, connect with your baby, and have all muscles aches and pains simply melt away. Regular massage will help your mind and body adjust to the changes that occur during pregnancy so that you may enjoy this unique time in your life without discomfort. This is the reasons why we offer a pregnancy package, and it is also a chance to save money. “Being able to have regular massages with Daisy through out my pregnancy has helped me mentally physically and emotionally. ​​Daisy Vitality Pregnancy Massage treatment offers you a head-to-toe maternity pamper. Using nourishing organic oil, your massage begins with releasing tension in the stressed areas particularly lower back and pelvis. Focused attention will also be paid to the head, neck and shoulders, and those tired aching legs and feet. There will be also an option for you to experience a gentle abdominal massage, which is a perfect time for bonding with your baby. Being a birth partner in 2012 was an honour and a gift. Witnessing the mother’s tremendous physical and emotional journey of labour and birth inspired me to undergo speciality training and gain an advanced qualifications in ante-natal and post-natal massage. It is my passion to assist women during their pregnancy and post natal recovery, providing them with a healing space to drop into their body, feel calm and connect with their baby. ​"Wow Daisy your Pregnancy Massage was Amazing! So deeply relaxing and nurturing. 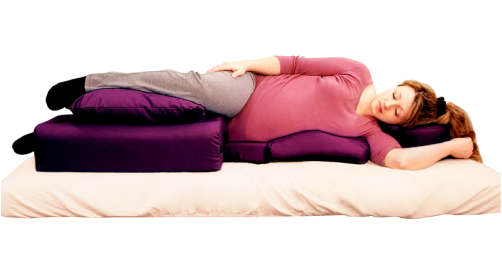 I LOVED the pregnancy body cushion it was so comfortable to lay in on my side. I felt completely cradled by cushion's super soft memory foam. My body felt completely suspended and weightless as if I were floating in water whilst receiving the massage. I had a lovely little snooze too I was just SO relaxed! I can't wait for my next session!" "By far one of the best massages I've had! I was unsure how it would work being 28 weeks pregnant(at the time) but Daisy made sure I was comfortable and relaxed throughout. I highly recommend Daisy whether it be a pregnancy massage or not, my back pain felt instantly better and I did not want the massage to end ! I will sure to be back before baby makes an appearance! Thank you so much Daisy!"